I would have been so anxious too. I'm so glad it turned out okay! Remember, so many of us can only dream of having a book signing one day…. It sounds like it went VERY well! If I ever reach that stage I'm sure I'll be a bundle of nerves. It sounds like you might have some new fans. i never forget the authors I meet in person. My published friends have had similar experiences. It's scary, isn't it? I'm so glad you had a good showing. I'll bet your personality welcomed people! Oh, boy! The thought of a book signing does give me the shivers! I've been hearing that even very popular authors don't get big turnouts for their signings, and that book signings aren't really the wave of the future! 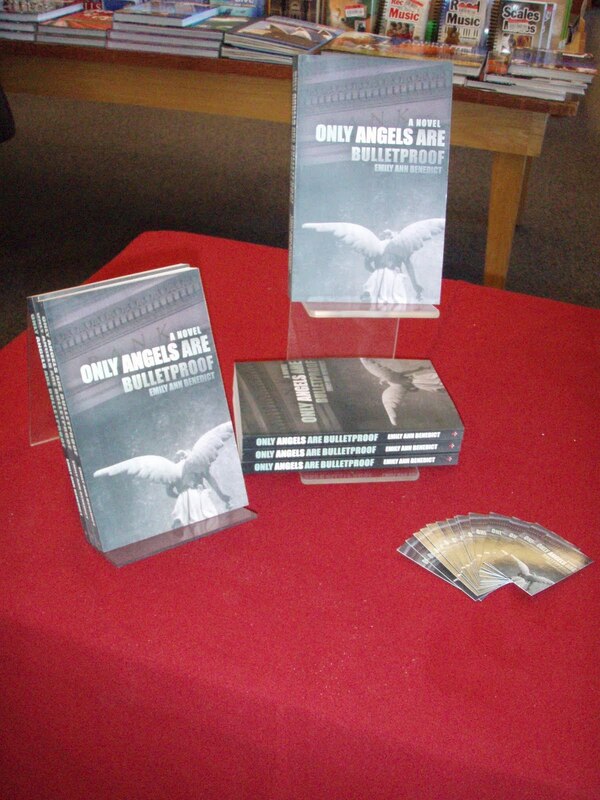 My publishing house encouraged me to do a local "launch" party. But otherwise have let me decide if I want to do more than that. There us a big unknown factor that is most definitely scary. I've heard book signing horror stories too! I'm not sure what the future holds for it, but I get a chance to sell 20-30 books in a day so I'll take that chance! You really have to be engaged though. I've been told by the managers that a lot of authors just show up, but don't put much effort into meeting people. I'd feel so guilty if I didn't sell any books! Congratulations again, Emily. Sounds like the day was a success. Have any more signings on the horizon?Have they written you up in the local paper yet? I live in a rural area and everytime Jason F. Wright (Christmas Jar and Wednesday Letters who also lives nearby) publishes a new book they write about it in the paper. I'm sure that helps him out tremendously. Sounds like you have a really healthy attitude and a good handle on what's happening. You are loved and supported. Also, looking good! I'm glad the book signing went well, Emily! I enjoyed the pictures!Yeah, if I ever get to the book signing stage (meaning, ahem, I have to first finish writing my book and then attempt to get it published) I will be a nervous wreck because I'm such an introvert and normally avoid talking to strangers… :-O LOL! Course, maybe if I could keep myself on a "high" from the excitement over the opportunity to share the story I've penned with the world, I might do okay. ;-) I know one thing, if I ever have a book published I want lots of people to read it!!! 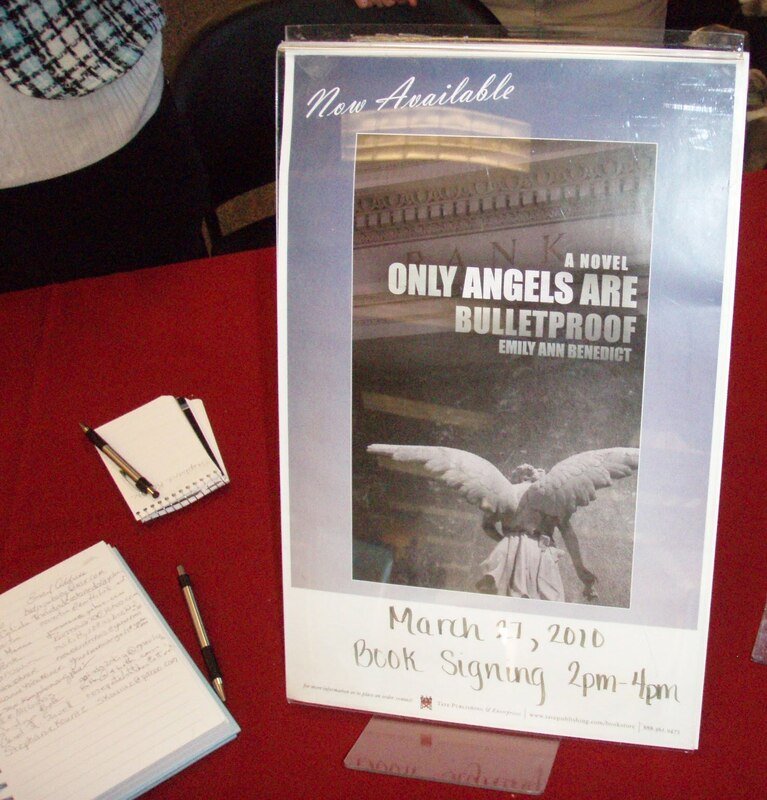 I don't have any more book signings scheduled at the moment, but I'm hoping to get one soon! So far I can get the papers to announce my signings, but as of yet I can't get them interested in a real write up. :? Maybe someday. Thanks Aunt Tere! :) Don't worry, Brianna, one you get to the book signing stage I'm sure you'll rise to the occation!! It sounds like it went well overall. :) I can just imagine the "drop and run." I'm glad your book signing ended well. I hope that your next one is even bigger and better . . . praise God for your new fans, and hope that they spread the word about how wonderful you are and how great your book is.